A total of 48 Rotarians and 1 guest attended the meeting and heard announcements concerning a speaker’s survey, The Polar Bear Open and learned the Veterans Honor Flight has been postponed until late October or early November. Tim Redman introduced the speaker – Ruth Milligan, co-founder with Nancy Kramer – of Tedx an outgrowth of an organization called “TED” founded in California some 25 years ago. The acronym “TED” stands for Technology, Entertainment and Design. 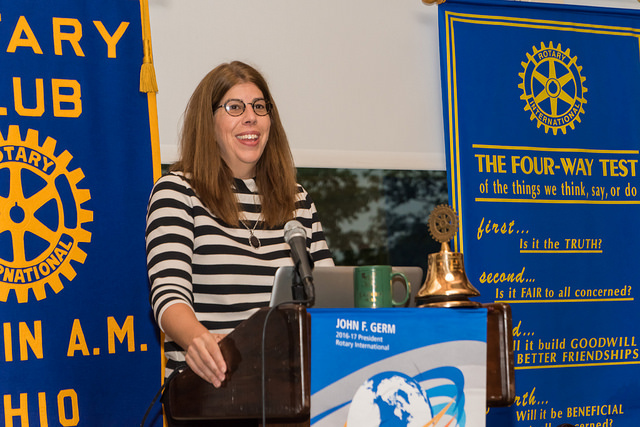 Ruth Milligan has a strong background in the Rotary organization through her father who was a founder of the Clintonville Rotary Club and was a Rotarian for 55 years. Over the years the TED conferences have spread both nationwide and globally. It has remained based in California and now supports independent organizers in cities across the nation identified now as Tedx. Eight years ago Tedx was brought to Columbus by Ms. Milligan and Ms. Kramer. Speakers are allowed no notes and there is no podium “to hide behind.” Ruth discussed the impact speakers have had and show showed a series of slides of Columbus speakers. She concluded with a Q and A session.